Inventory We are a resale marketplace, not a box office or venue. Ticket prices may exceed face value. This site is not owned by Ford Field . 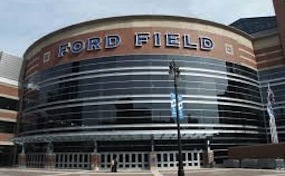 Ford Field opened August 24th, 2002 located across from Comerica Park on 2000 Brush Street in Detroit at a construction cost of $430 million. Ford Field Box Office has played host to some of the biggest events in the country in its short history. These events have included Super bowl XL, Wrestlemania 23, Madonna, the Frozen Four, NCAA Basketball tournament, and the largest crowd to ever attend a college basketball game at 78,129 people. Ford Field is home to the National Football League's Detroit Lions. Ford Field was built to incorporate a six-story Hudson warehouse that has stood in Detroit since the 1920s. Henry Ford, the owner of the Lions, has locked up the naming rights for the Field for the next 20 years at a cost of $40 million. TFieldDetroit.com is a privately held company that specializes in the sale of tickets in the secondary market. We are not affiliated with any official supplier or box office. To purchase tickets to any Ford Field in Detroit events simply call our operators at anytime or click on the event you wish to attend.